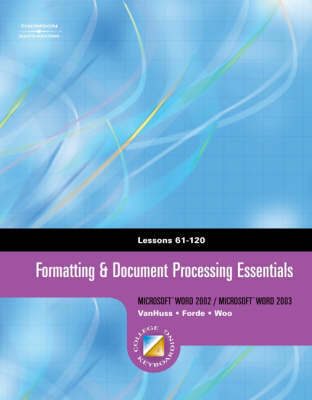 "Formatting and Document Processing Essentials, Lessons 61-120" focuses on mastery of formatting letters, memos, reports, and business documents using the function of Word 2002 or 2003! Additional skillbuilding is included to increase keyboarding speed and accurancy. Word processing skills are isolated and introduced prior to document formatting lessons, while proofreading skills are reinforced within the documents. The document formatting lessons are devoted solely to documents and teach no additional word processing so users can focus on formatting mastery.